I purchased this tablecloth for my mother who lives in a small, extended living apartment. The table is one of the focal points in her living area and this table cloth looks beautiful. She gets compliments on it whenever someone sees it. Can't beat the price either. These looked really great in our social hall. They are elegant looking, don't look cheap. I purchased this for my parents. My mother likes a tablecloth that is easy to clean for every day use. She's been having trouble finding one in the stores. She is very happy with this tablecloth. It fits her needs and the quality is good. She would definitely purchase it again. Love my new table cloth. I ordered 2 and now I am going to order 3 more in different colors. Wipes clean without moving all over the place which was my major concern. This table cloth is on my dining room table and I use it for everything except the most formal occasions. It's attractive, the color is muted (which is exactly what I wanted), and it's so easy to clean. With kids that is so important. 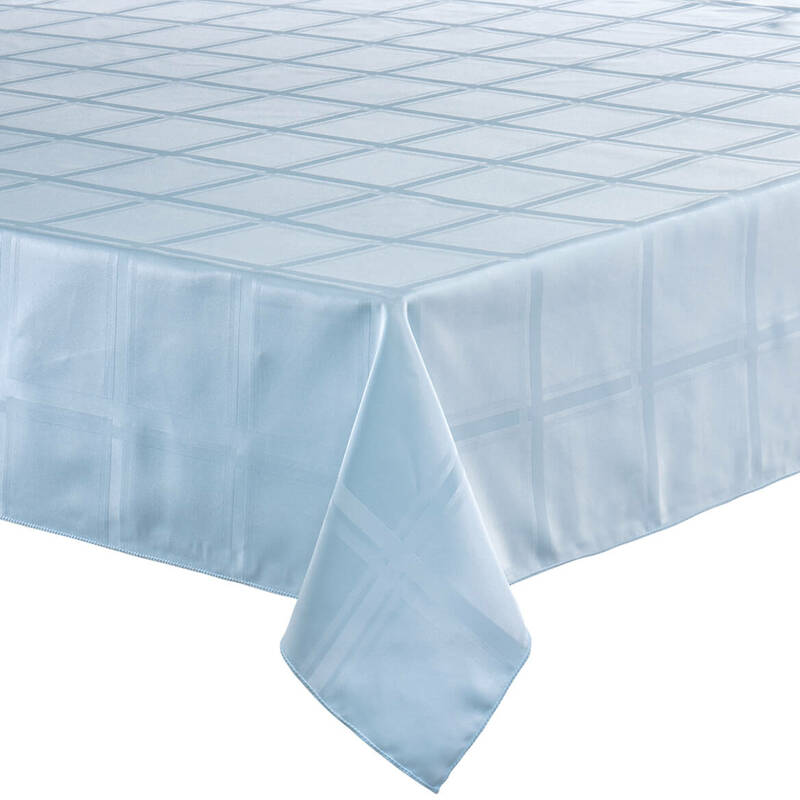 I've used earlier versions of these table clothes and they last forever. A real bargain for beauty. Great tablecloth-just the right size. this tablecloth is very attractive and practical. It protects the table and still looks good. It was just the right size. The tablecloth is for a large family table that seats 8, Mom has a flooring that has a beautiful green in it. The tablecloth goes so well. It is so easy too just wipe clean after large family gatherings. I like this because it is a high quality for everyday use, it is not thin and cheap feeling. It protects the table too. The pattern is not too bad either,I have the dark green one. It's a nice looking practical protection of the dining room table from my grandchildren's spills and coloring. This will be my fourth tablecover of this type. Ours is used every day and yet lasts a long time. It does start to fade after a while, but for the price you can't beat it. Plus, not many come with the flannel backing anymore. You need that to protect your table! Well, first I bought the cover too big, but that's ok since my dining table has 4 leaves to it. The design looked much better on line so I was disappointed when I put it on the table. However, it is a good, sturdy quality and I'm only using it for whenever the grandkids come over or if we're using the dining room table for arts and crafts or something like that. Obviously, you wouldn't use it for formal dinners or holidays, but it is good quality and it wipes up nicely and washes well. I would recommend it. I bought the beige, green and burgundy table cloths. The table cloth stays on my table 24/7 because I have 4 kids. It is thinker than many. The beige color is prettier than the pictures shows. Great quality for the money. It beautifies my dining room table. I have purchased several of these. I even shop ahead so I always have one on hand. Received many compliments on the Bordeaux look and quality of the tablecloth and so far I am very pleased with its easy care. This tablecloth is multi-useful. It stays on my dining room table (except for card-playing when I want a white bakcground). I use it for meals, for holding magazines and mail; a basket in the middle holds notices and reminders, and I often use it as a desk. Useful addition to the kitchen. I bought a tablecloth from here before and the quality was great. Looks great and so easy to keep clean, protects my natural wood table top. Purchased for my Mother. She is extremely pleased with the quality of this product. get seams out, put in the dryer for about half a minute. I like the brilliant Hunter Green color. I use it for the kitchen table but also cut a piece for the top of the microwave and on certain areas of the counter top. This is the 5th or 6th time I have ordered this table cloth and will get another one just like it when this one wears out. Matches more dishes by being a solid color. Thanks for caring this product. I love these table cloths, they're thick and the color stays right there. They are nothing like the store bought vinyl cloths. They last a long time. Is a wonderful color and easy to clean. Have it on my dining room table. Matches pertfectly. 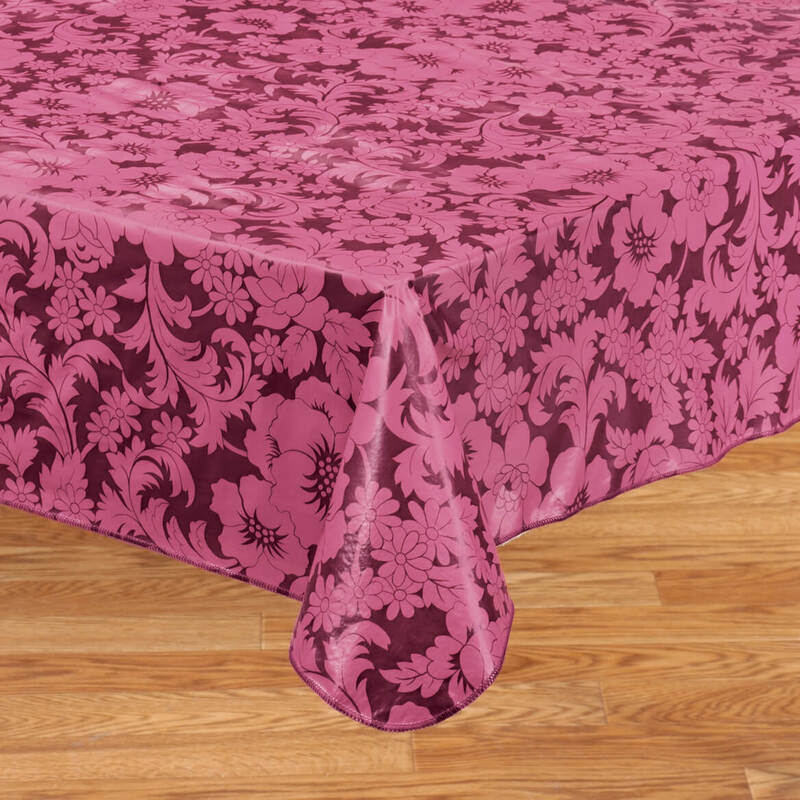 I have bought a few of these large tablecloths in different colors and love them. They are durable and fit my large table well. when my friends and family like it the product,i give it at a gift to my neighbor and she told me that she love it,she like it,.her nurse ask her where that she buy. This size vinyl tablecloth is hard to find. It works great to cover a diningroom table or a craft table. It looks good too. My mother has been looking all over for a 60 inch tablecloth, not 70 inch like everyone else has. She wanted one she could just wipe off with a damp dishrag. PERFECT!!!! This was a gift for my daughter to be used on her kitchen table. Sturdy vinyl tablecloth - heavier than the ones in the stores. I have not been able to find a 60inch vinyl anywhere. I have bought this tablecloth many times. I want to buy two more table covers. I bought two of these table cloths to protect my tables during the week, but I'm finding I never take them off, even with company. I have cloth table covers, but they are a hassle, and I'm finding I'm not using them at all. I use this on our kitchen table and it is so easy to wipe it off. Looks very attractive on the table. Since this wipes clean when someone spills something I am sure I will enjoy it for years to come. We have happily used these tablecloths for years. The pattern is quite elegant. We have doubled our use of the tablecloth by always buying an extra large tablecloth and using it to cover our pale beige fabric dining room chair seats. That way not only is the fabric of the chair protected,but the chairs match the tablecloth exactly, giving a very elegant look. Highly recommended. We use it for everyday and special ocassionsi. It is thick enough to stand up to wear & tear. It looks great and comes in a variety of colors & sizes. With 10 young grandchildren dropping lots of food and drinks, this tablecloth handles the task. It protects my beautiful oak dining room table and still looks pretty. I needed something to perk up our RV, and this tablecloth really did the trick! It looks so elegant! My only negative comment would be the color is a little darker than what the example shows but it still works perfectly with the colors in the dining area. Purchased this vinyl cloth with the decoration printed on it to add a bit of elegance to our dining room table, but to have the family with our grandchildren enjoy being all at the same table. You really can't tell it is vinyl and when food items or spills happen, it cleans right up. It doesn't mess up my very expensive cloth tablewear items. This is my 2nd order because of table size difference once we moved. Great quality and value. Bought 4. 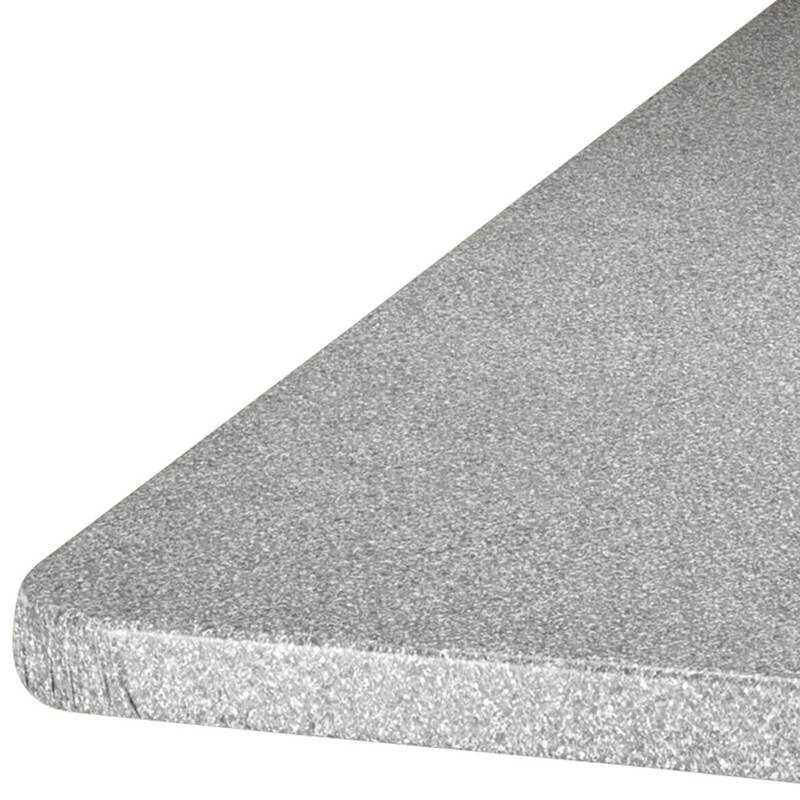 This is used to cover our washer and dryer, thus allowing a great work surface that is easily sponged clean. It is a beautiful pattern, and we were delighted how thick it is. Certainly beyond what we expected. Thank you! I certainly would buy this tablecloth again. Don't know what took me this long. Feels like cloth and hangs just right on my table. I have been looking for the color table cloth that I purchase, but others have been way off color and it had a bad odor, So when I purchased this one from here, it was perfect, it fit, the right color, and no bad odor. I am very pleased. Really great looking in our social hall. Elegant looking, does not look cheap. DONT WRITE ENGLISH---EVERYTHING I BUY IS GOOD,I LIKE. 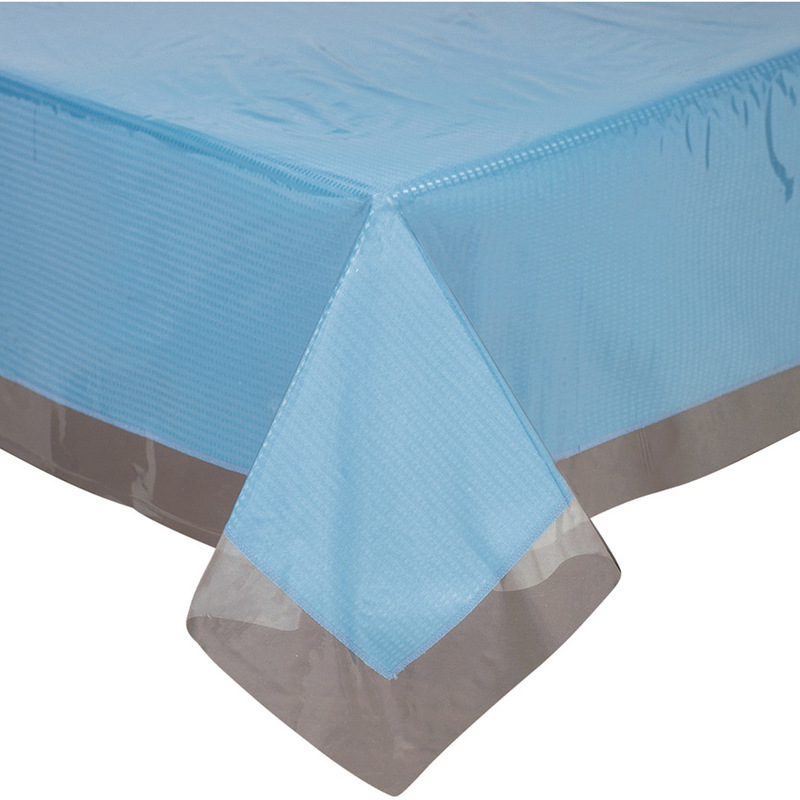 The table cover is very durable and we use on the table that we eat at every day. I already own 6 of these table clothes, I will by more!!!!! They have many colors, holds up great, and Looks some what elegant!!! but this looks nice on glass dinning table. The tablecloth looks good for everyday and a family dinner. It wears well and the color goes very well with my dining area. It protects as well as looks attractive. I have a beautiful wood kitchen table that I don't want scratched. This cloth has a flannel backing which protects it. The soft vinyl cover and design is actually attractive enough to use as is. Or it can be covered with a regular table cloth if one wishes a less 'kitchen' appearance, while the vinyl/flannel remains to protect the wood. Very pleased with my new tablecloth. True to size, durable and looks great on my table. I had been looking for a simple vinyl tablecloth for everyday. I would have settled for a cheesy vinyl tablecloth that looked like plastic. I just needed something that wouyld protect the table and be super easy to clean because I have a 2 and 4 year old. This tablecober is maybe even easier to clean than any other vinyl tablecloth but it looks much much nicer. While it does not look like cloth it has a unique appearance which I have grown quite fond of. It cleans so well. My kids paint color, smear it with red sauce and it wipes right off. And again let me say again it has a great appearance!! I have washed it several times and has held up great!! This is the best tablecloth ever Please Please don't stop selling this tablecover!!!! This is a very attractive tablecloth. Great buy. Glad I finally found it!! I shopped everywhere to find a vinyl flannel backed tablecloth that was attractive. They are hard to find in stores. Walter Drake has everything that you can't find elsewhere!!! 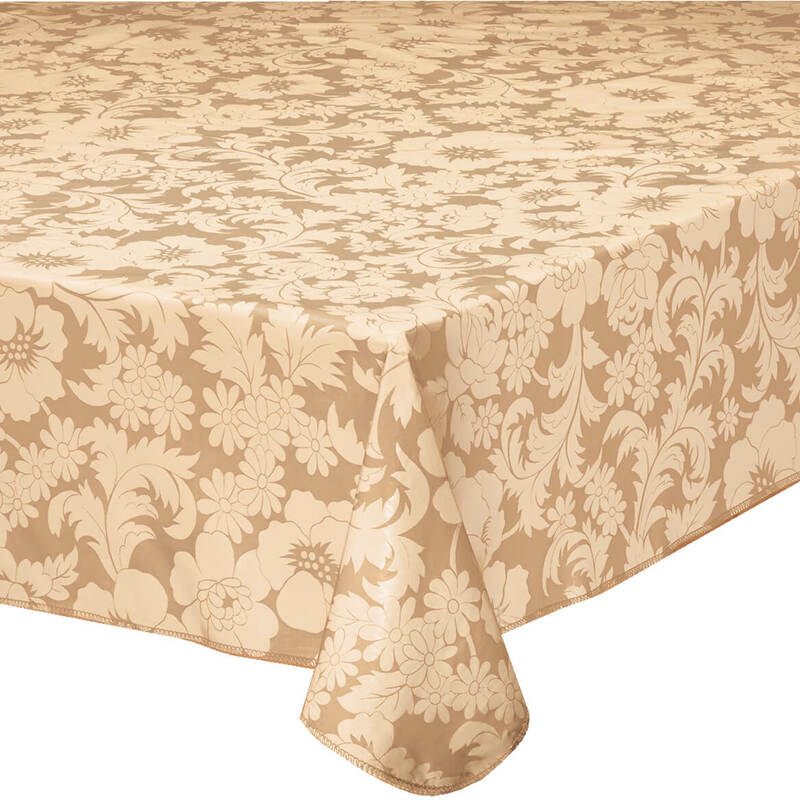 I ordered several of these Bordeaux Floral Vinyl Tablecloths for our Lodge dining room. The members have been more than happy with the look and feel of them and are certain they will hold up for a long time. Everyone has been very impressed with them. I would recommend these to others. It is perfect for my tables on the lanai! The celedon color is a fresh looking mint color and coordinates beautifully with my out door cushions. It is perfect on the lani. I would buy this product again. This tablecloth stays on the table really well. I'm very happy with my purchase. This product looks good for a long time. When it shows wear, the price makes it easy to just replace it. I love this tablecloth. I think I am going to get a larger one with the same pattern for when the leaf is in the table. Good quality ... holds up well. I love these tablecloths. They're durable plus attractive. A great product. The color is bright and adds to the color scheme I want for any event. 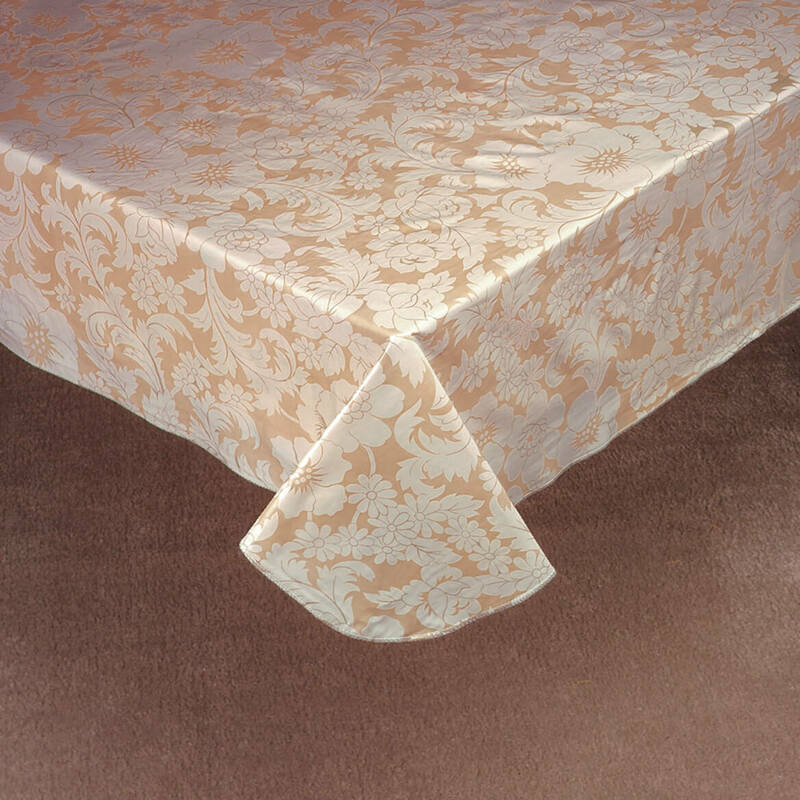 It also works well under lacy cloth tablecloth to add color to more formal needs. Used daily. We cover the outside tables. They work well. I've looked everywhere for years for this type of tablecloth (vinyl with flannel backing). It's great for use when grandkids come because it doesn't matter if they spill things on it and can be wiped clean in a jiffy. This pattern is very attractive and the quality is better than I had expected. Super product. Easy clean and looks good. I have been looking forever for a white vinyl table cloth. It isn't too heavy which makes it hang really nice. I am ordering another one for a spare. Was looking for a table cloth in the right shade to match my kitchen, this was it. We have a very large dining room table and need to have tablecloths 60" x 120" oblong. I love this particular tablecloth and have already bought about five others like it to replace it every one to two years. Design is beautiful and I like that it's vinyl so I can just wipe it clean. Only "con" is when one of our cats reaches up to the side and puts a few holes in it (but that's a whole other story ;-)). I really like the tablecloth. The tablecloth was a nice heavy vinyl. Some tablecloths are flimsy and don't hold up. I purchased the Bordeaux in white that looked more like a satin fabric and added to my dining room elegance. After many compliments, I ordered a second one to have on hand in case no longer available to purchase. It is used every day for all meals and easily wiped clean. This table cover meets my needs exactly. 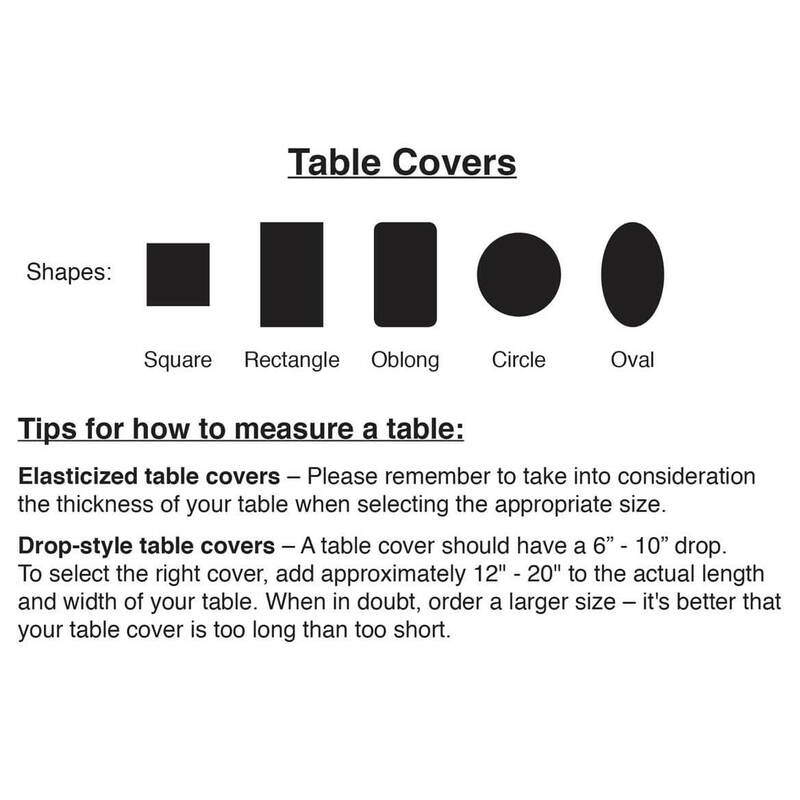 This table cover is well-made and is ideal for a table which gets almost constant use by members of my family. Easy to maintain, and the color and floral design are pleasing. I'm thinking of ordering it in another color. Burgundy Bordeaux Tablecloths a big hit! The last set of tablecloths like these were purchased three years ago and used in our faculty lounge at the school where I teach. They are durable and do not fade! 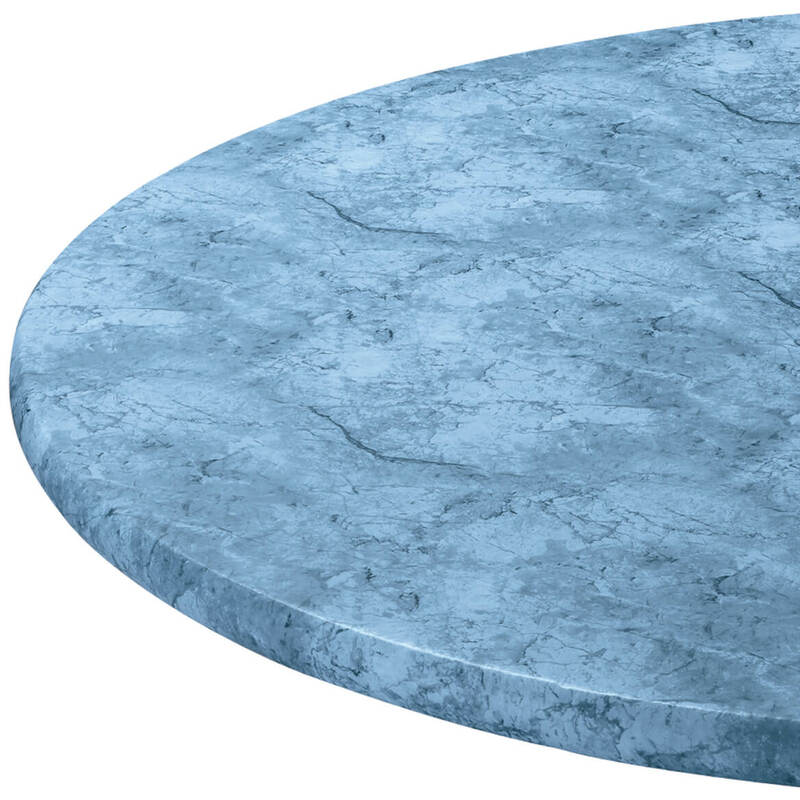 Nice soft material which lies well on table. Soft pastel color. Does a good job repelling liquids. Excellent price and value. I have this on my kitchen/dining room table and it's great! I use this tablecover on my dining room table because it is easy to care for and it is bright and clean looking. The table cover works like a dream. Just what the table needed. The color even grew on me even though I originally wasn't sure it was the same color as what it looked like online (was darker when I got it in the mail). Lots of less expensive vinyl covers are not as durable as this one. I expect this will last and look great far longer. It is extremely easy to clean up after eating. Neutral color accents decorations that may be added to the table for change. This table cover does exactly what it is supposed to do. Spills wipe clean easily. As others have mentioned, the color is not as shown. The white is very white with silver flowers. Customer service is great! My table cover arrived with a small black spot that looked like ink. When I emailed them with a photo, I was answered promptly and a new table cover was sent right out! Just what I've been searching for for ages. My only surprise, though not necessarily bad, is that it wasn't as thick as I'd expected, so it doesn't offer quite as much table surface protection as I'd hoped for. Otherwise, I'm very pleased. I am using this for everyday use & protector of my new table. The soft beige & ligther colored flowers give a nice contrast. If your eating area is bright with sun coming in - the beige color will look brighter & as an earlier comment stated - almost gold. I personally would not have been as happy with the beige color if my eating area was dark. Tablecloth does move about the table but I can live with that - perhaps a better made pad under it will help. Good quality table cloth for the small price. Hope it is lasts a long time. This is a very attractive tablecloth, perfect for messy grandchildren and still looks elegant. Would like it to be a bit thicker. On wood dining table it looks best with another cloth underneath it otherwise the wood shows through. This is the second Bordeaux tablecover I've purchased. The first was beige; I now have a hunter green. My dining room table is very large and is used more as an office than for dining. This product is durable and attractive, too. The pattern is lovely and I will definitely purchase another. I love the size and color choices! Finding a blue tablecloth was very difficult. I use the cloth every day. Doesn't show ink from newspaper. Knew what color I wanted but had trouble knowing which name it was. Guessed right and it looks nice. We only have one table for almost every use. It is used most of the day in one way or another. It resists stains better than others I have gotten and stays together for the three or four months I leave it on the table. It cleans easily. This beautiful tablecloth definitely met my expectations. It is long enough to fit my large wooden table, and it is easy to wipe clean. It is holding up well with my family using the table daily. I use these to protect my wooden kitchen table. They last a long time and when they finally year I just replace with another of same or different pattern. Love the marbleized ones too. I Would Buy This Table Cover Again! Glad that Miles Kimball continues to carry this table cover. This is the 2nd time I purchased one in 10 years. We use it for our family time--it is very useful with our 2-year old and looks nice for guests. Used on tables in social hall at church. Very durable and easy to clean. Looks great on the table and stands up well to our large family. I will continue to buy these as long as they sell them. 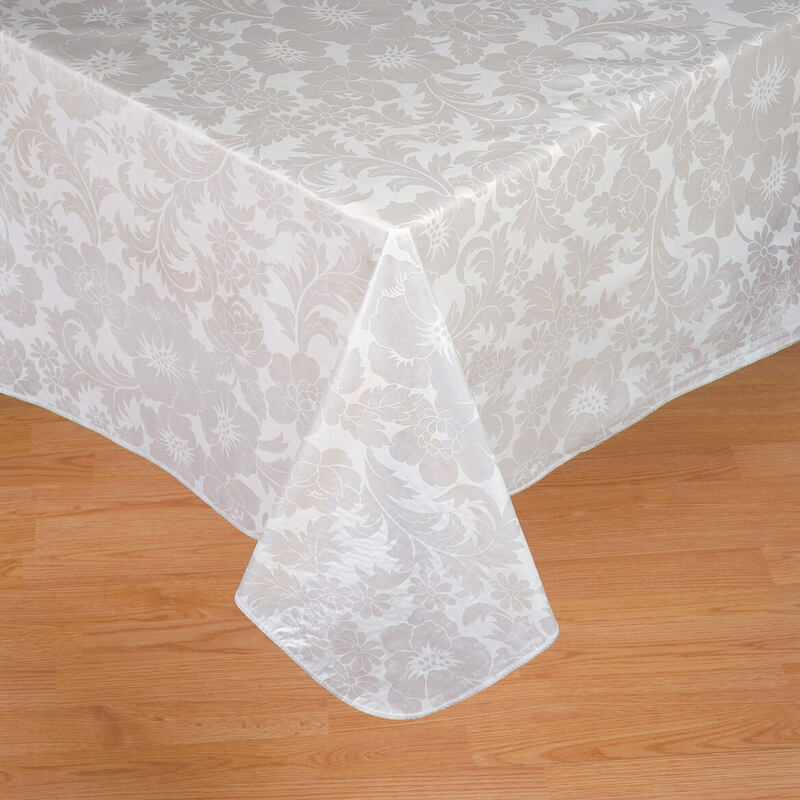 We use these tablecloths for parties - the white looks great in a room full of tables! I like them for my family room table, because I don't worry about my oak table top getting scratched when we play games on it. This tablecloth looked very cute when we received it; however, after wiping it off after meals, for a week, there are already fade spots in the print. It is to be expected that vinyl tablecloths will fade after use, but I wouldn't have expected it to happen after a week. Bought these to go on serving tables for a party. The white is more silver design on a less visible white background. The pattern is large and bold so if you're looking for a mostly white cover, this is not the one to get. It is thinner than expected but will serve my purpose. ****Great color & so easy to clean. To protect my wood table. This looks really good in our social hall. Wish it had been 70 or 80 inches to give better coverage. Reasonably good quality for deck table use. However, I ordered the 2 shades of green table cover, but it is olive and gray; definitely not what I thought I was getting, but it will have to do. To cover the dining room table. Buyers for retailers etc. need to get out there and find high quality vinyl tablecloths that will hold up to everyday use. Wood tables are in style and need to be covered and protected everyday. Am sending this back unopened as the color is so bad. Not what I ordered! Color wrong! Colors are not the same! I am returning these products. I ordered three tablecloths -- three different colors. None of them are the colors represented in the catalog photo. The green, which looks like a nice Christmas green, is more of an olive drab, the blue is definitely not the pretty blue in the photo and the burgundy is not an attractive color either. I didn't even take these out of the package. Looking for a vinyl tablecloth that doesn't look plastic. Am hoping this will be what we are looking for! been looking for felt back tablecloth in white. Have had these for years. Seem to hold up the best. Pretty pattern not to formal--subtle beauty. Last time I bought one of these it looked good and had a good quality flannel backing. If it still does, I will be very happy with it. Lately, it has been hard to find a white plastic tablecover that looks good enough to use all the time. Liked choice of sizes and colors. My daughter had these in the past and I liked them, plus it was available in the color I wanted and couldn't find elsewhere. Already have one and it fits. I haven't been able to find the 60" tablecloth I need. I saw this one in your catalog and ordered it. Got the beige tablecloth. Wanting something more casual/easy clean up when playing cards or board games (needing to protect the wood table). The reviews sounded reassuring, in terms of quality. My Dad had this tablecloth before and really liked it. It is durable and looks nice. It is also one of the few 60 inch round cloths out there. I need a table cover that is easily cleaned in a short time. I also think that this cloth is very pretty and can be used in the kitchen or dining room. The price is a great bargain! 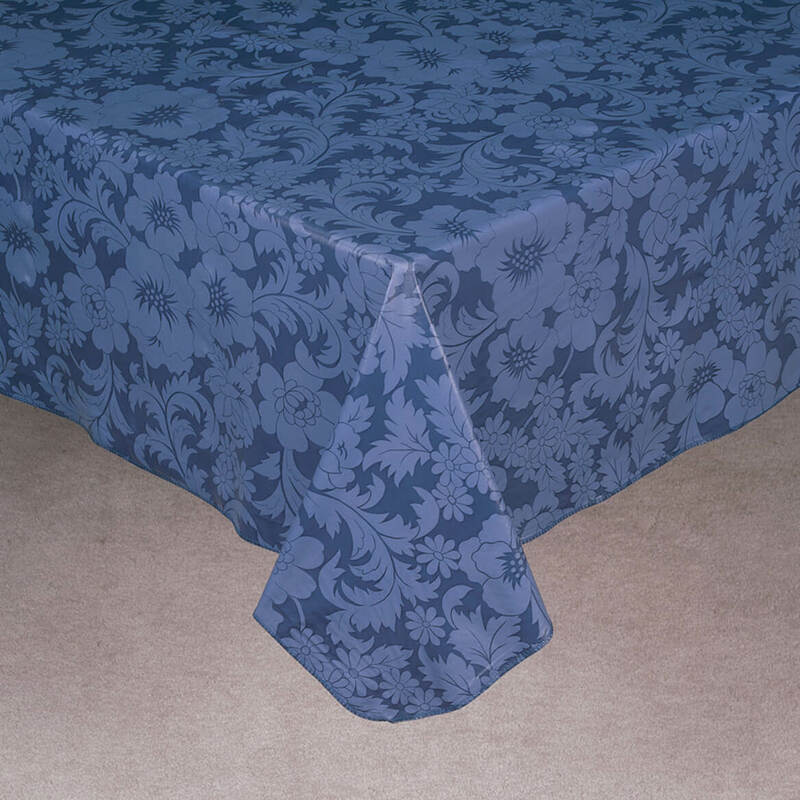 THIS TABLECLOTH IS MY FAVORITE DESIGN AND PRICE AND SIZE, I HAVE HAD SEVERAL IN THE PAST. Because I got tired of my family making a mess of my good tablecloths? 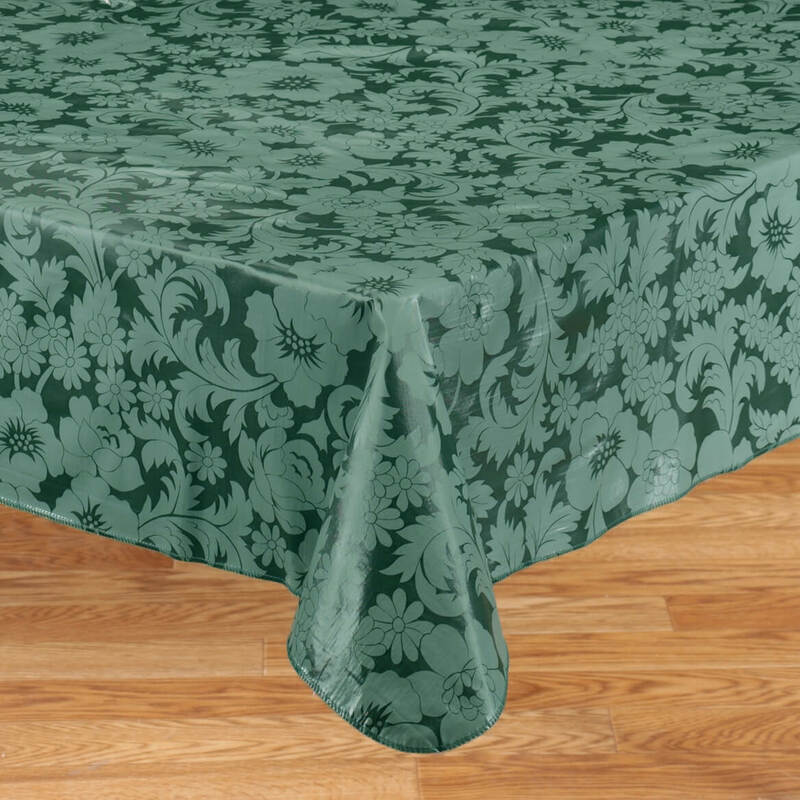 I have a tablecloth like this and like the ability to clean it on the table. Where the folds are there are cracks so I need a new one. Because I can't find a white vinyl table cover with elasticized edge to fit a 60" table. I have to add the elastic myself. It was the closest thing to match what the church already has. 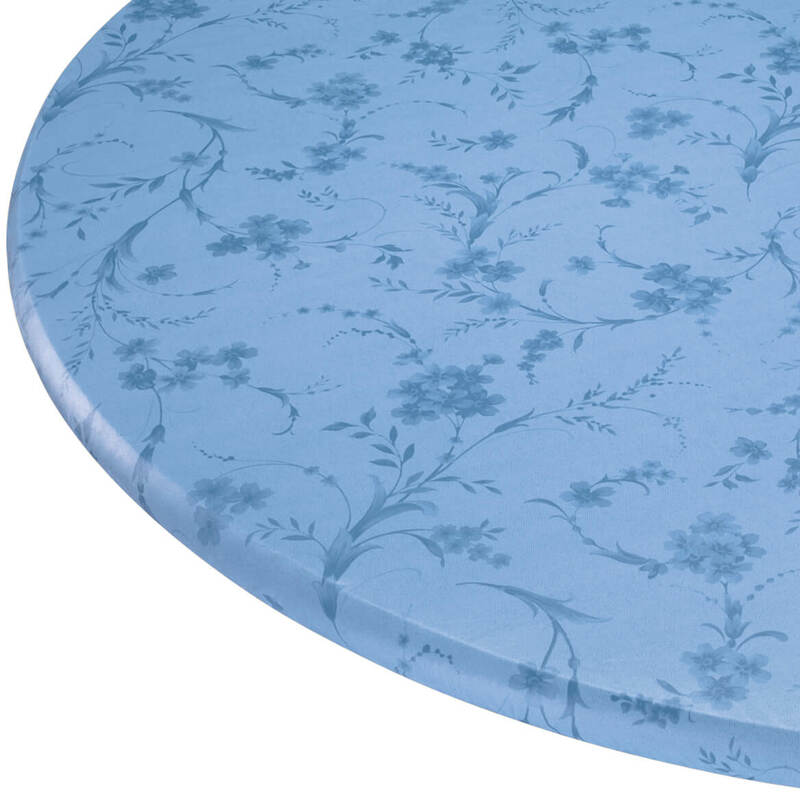 Is the wedgewood the light blue in the bordeaux floral vinyl table cover? BEST ANSWER: Thank you for your question. Wedgewood is the darker blue. We hope this information will be of help to you. Will 2 60x120 fit a ping pong table? BEST ANSWER: Thank you for your question. You will need to know the measurement of a ping pong table. We hope this information will be of help to you. when will celedon and light blue be available? BEST ANSWER: Thank you for your question. Celedon and light blue are both retired. We are not getting anymore in those colors. We hope this information will be of help to you. Would like the light green, celadon. How do I pick that color? BEST ANSWER: Thank you for your question. The celadon is no longer available. We hope this information will be of help to you.